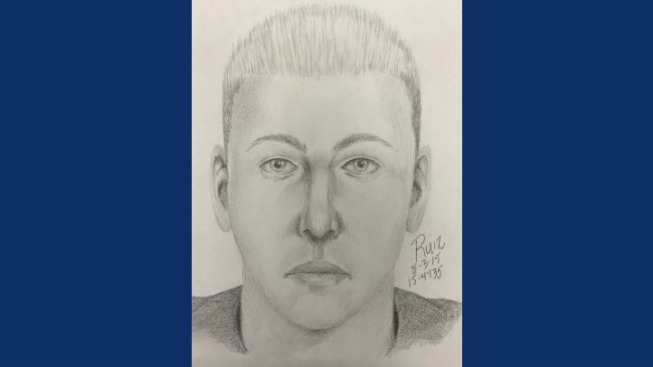 Palo Alto police are looking for three men - one posing at pizza delivery man – who pretended a family had ordered a pizza, and then pushed their way inside during a home-invasion robbery attempt. Lt. Zach Perron said no one was hurt and nothing was stolen during the robbery attempt Sunday at 9:45 p.m. in the 4200 block of Suzanne Drive. Police on Monday released a sketch of the suspect posing as a delivery man. He was described as a white man in his 20s, about 5 feet 8 inches tall and 170 pounds. He has blond hair and brown eyes, and was wearing a white long-sleeved shirt under a red short-sleeved T-shirt with yellow and white writing on the front. Perron said that the man knocked on the door saying he had a pizza, and when the family members said they didn’t order one, the man pushed his way inside and was followed by two other masked men. Each masked suspect was armed, Perron said, one with a semi-automatic pistol and the other with a knife. The mother tried to scream, but one of the men covered her mouth, Perron said. The father then rushed in to help his family, police said, at which point the suspects ran away. The two masked suspects are described as men, about 6 feet 2 inches tall and 220 pounds with muscular builds. They were wearing all black clothing and black masks. The suspects were in the home for less than a minute. No one saw the getaway car, Perron said. "We believe we know why they were picked by the suspects," Perron said of the family. Investigators will not reveal why they believe the family was targeted, but said the victims are innocent and did not know their attackers. Anyone with information should call 650-329-2413. Anonymous tips can be e-mailed to paloalto@tipnow.org or sent via text message or voice mail to 650-383-8984. Tips can also be submitted anonymously through bit.ly/PAPD-AppStore or bit.ly/PAPD-GooglePlay.